A few miles north of Dolgelly, the county town of Merioneth- shire, North Wales, in a beautifully wooded park, lies Nannau Mansion, the ancient seat of the Vaughan family. About the end of the fourteenth century or beginning of the fifteenth there lived at Nannau a Welsh chieftain called Howel Sele. He had many relatives, among them a cousin, the famous Owen Glendower, who lived not very far away. Unfortunately, however, between the two there was a very bitter animosity; some said owing to rivalry in the field of sport — archery, quarterstaff and the like — and others to a love affair, Howel being jealous of his cousin, towards whom he thought his wife showed too friendly a spirit. Their mutual dislike was well known and it grieved no one more than the Abbot of Kymmer, who was fond of them both. The Abbot had often planned how he could effect a reconciliation between them, and at last one day he made a bold attempt at it. Without giving either man a hint as to what was in his mind he invited them to dine with him. Neither suspecting, of course, that his enemy was coming, they both appeared, and for a short while the worthy Abbot had a very anxious time of it. In the end, however, he managed to pacify them, and before they left his presence the hatchet was apparently buried, and they seemed to be on the best of terms. A few days later Howel invited Owen to the chase — a day’s deer hunting — and the two, accompanied by several of their respective retainers, went off together to the woods around Nannau. Pursuing quarry hour after hour, through sunny glade and cool, shadowy dell, the two cousins suddenly found themselves side by side in a small clearing. “Hush I” Owen whispered, touching his kinsman lightly on the arm, “do you see that doe over there? Prove your prowess by shooting it.” He pointed, as he spoke, to a brown object, half hidden by bushes and high waving grass, a dozen or so yards ahead of them. Howel, at once fitting an arrow to his bow, was apparently taking aim in the direction indicated when suddenly, without the slightest warning, he swung round and discharged the missile full at Owen’s breast. Owen, luckily, had under his shirt a coat of mail, and the arrow glanced off it. Roused to a fury by this act of treachery he at once drew his sword and Howel fell, mortally wounded. Before dying he cursed Owen, telling him he would never enjoy a moment’s peace again and that he would haunt him and his heirs forever. Glendower realised that to make the incident public would mean the beginning of a feud between the Seles and Glendowers which might easily lead to a civil war in Wales and thus result in a national catastrophe. Yet, to keep it dark was something out of keeping with his character. In a land where all men at that period were deemed valiant, he was rightly regarded as being a great warrior, a most perfect gentleman, and the last person to do any- thing at all underhand. His dilemma was solved by the sudden arrival of Madog, a bosom friend, who, seeing the danger in which Owen stood, at once suggested hiding Howel’s body in the hollow trunk of a great oak tree that stood near by. This tree had a very sinister appearance. It was not only blackened and scorched, where it had been once struck by lightning, but its widespreading, knotted and gnarled branches bore a peculiar resemblance to the malshaped arms of a human being. It was known and shunned for this reason, though hitherto there were no substantial grounds for associating it with the super- natural. Yielding to the persuasions of his friend, Owen Glen- dower caught hold of the bleeding corpse and between them they carried it to the oak and dropped it in the hollow. Next day, as Howel had not returned home, a great search was made for him. All Nannau and the surrounding country was scoured, but, although caves, bushes and ditches were examined, no one thought of looking in the hollow of the notorious oak. Some thought he had fallen down some well or into some obscure pit, others that he had been drowned while attempting to ford the swift and treacherous River Mawddach; others, again, that he had been seized and carried off either by brigands or by a band of marauding English soldiers. Time passed, and Howel’s fate became one of those mysteries that the whole countryside sat to discuss on dark nights before a roaring fire. In the meantime, however, some strange stories began to circu- late. Close to Nannau was a hill called Moel Offrwm, and more than one person crossing it after dusk testified to seeing the shadowy form of Howel Sele standing by the wayside, his corpse- like face scowling. One peasant declared that he was pursued for more than a mile by the figure, which followed him persistently through briars, brushwood and water, only leaving him when he came within sight of a church. Phenomena were encountered, too, on the rugged slopes of Cader Idris. One stalwart farmer stated that when he went to look for his cattle one night on the sides of the mountain he saw pale lights of a nasty bluish-green hue flitting in and out of the boulders. Thinking they must be Canhywllam Cyrth, or Corpse Candles (spirits in the shape of candle flames that appear to some Welsh people before the death of a relative), he stood rooted to the ground with fear, staring open-mouthed at them. Then, quite suddenly, the lights came together, taking at first the form of a huge flame, and almost immediately afterwards that of a man, gigantic and shadowy. The farmer was terrified, for he recognised in the shape that towered above him the features and figure of the missing Lord of Nannau, Howel Sele. The expression on the apparition’s face was dreadful. The eye- brows scowled diabolically, the mouth was contracted into a savage snarl, while the eyes blazed with a hate that the wretched farmer felt could only owe its origin to Hell. Raising one hand, the figure was in the act of striking the farmer, when the latter instinctively crossed himself and muttered a prayer. The moment he did this the whole expression and attitude of the apparition changed. Fear and dread, a dread that was really terrible to see, seemed to sweep through it, and turning on its heels with a gesture of despair, it glided away. As it went, winding its way in and out of the huge black boulders that lay scattered in all directions on the mountain side, a dull and melancholy wind rose suddenly and, tossing the branches of the naked trees against the starlit sky, flew after the figure like one lost soul following another. The farmer, having at length recovered his faculties, made for home with all speed. Among others who witnessed strange phenomena were Howel’s aged nurse, who had been devoted to him, and his venerable steward. Tradition says that both these two frequently used to see a tall, spectral figure, which they recognised as their lost master, in the grounds of Nannau, though never once in their experience did it actually enter the house. Sometimes, when they were sitting in one of the rooms on the ground floor, they saw a white haggard face appear at a window and look in at them, angrily, until they prayed or uttered some pious exclamation, when it at once became sorrowful and withdrew with a groan or sigh. At other times, when they were looking out of their windows at night they would see it peering up at the house from among the trees, and, perhaps, wringing its hands and going through all the antics and gesticulations of a lost soul. The idea conveyed to them both by its appearance and behaviour was that it was damned, and labouring under some dreadful curse. But it was the oak tree itself, in which the body of Howel was hidden, that was the worst haunted. No horse ever passed it, either in the daytime or at night, without shying, while all kinds of phenomena were seen and heard in its immediate vicinity. Sometimes uncanny lights were seen hovering in its branches, while at others awful moans and groans were heard to proceed from it. Knowing the tree and its evil reputation only too well they did not dally to investigate but fled panic-stricken. As for Owen Glendower, though he knew there was ample justification for his having fought with Howel, and even excuse for his having killed him, he could not get the vision of his cousin’s bleeding corpse from his mind. It haunted him day and night. Often at night Owen awoke with a start to hear, or fancy he heard, a voice whisper from the darkness, “Accursed!” He recognised the voice as Howel’s. The feeling that he actually was cursed grew on him, and he became seized with a deep melancholy. Still, something always held him back when he felt impelled to disclose his dread secret. At last, after ten years of torment, he finally succumbed to an illness. Just before he died he sent for the faithful Madog and bade him hie away to Howel’s widow and tell her the entire truth. Promising to do as requested, Madog set off at once to Nannau, and Glendower, feeling that the curse had been removed from him, breathed his last. True to his trust, Madog sought Howel’s widow and gave her a detailed account of her husband’s death. A party of retainers was at once sent with him to the oak and the truth of his story was speedily established by the discovery of the armour-clad skeleton. But though the skeleton was taken to the chapel of Nannau, where prayers were said over it, most recorders of the grim tragedy maintain that the priestly efforts were in vain. There is a saying that curses not infrequently have a habit of recoiling on the heads of those who utter them, and this would appear to have been so in the case of Howel Sele. The spirit of Owen Glendower troubled no one, though Sele had declared it should know no rest, but with Sele’s own spirit it was otherwise. The blasted oak still continued to moan and groan and yield other phenomena that seemed unquestionably to be associated with the Lord of Nannau. 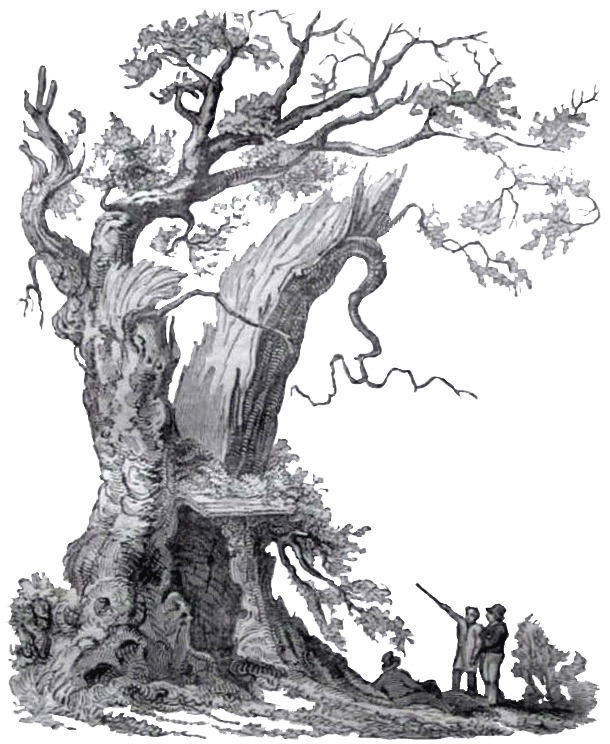 One of the most extraordinary stories, vouched for by the local peasantry, concerned the evil power of the oak to kill those stray- ing into its grip. Half a dozen men were found dead at its base with marks around their throats as though they had been strangled. In one story at least there was an eye-witness of what was alleged to have occurred. Two travellers were making their way through the Nannau Woods when they were overtaken by darkness. They decided to spend the night at the base of a great oak which, although they did not much like its appearance, promised the best shelter about. After their supper they stretched themselves out and went to sleep. One of the travellers awakened from a dreadful nightmare. He had dreamed that from the trunk of the tree under which he slept long knotted arms had begun to drop. At their ends were smaller branches that looked like grotesque hands. And these uncanny arms and hands crept slowly down and down toward him while he lay helpless in terror. Just as they were about to touch him he managed to awaken and with a scream rolled away, leaped to his feet and fled. He ran perhaps fifty paces, and then this terror of what had seemed a too vivid dream dropped from him. He stopped, shame-facedly, and looked back, wondering if he had awakened his companion. To his amazement he saw that his companion was apparently climbing up the trunk of the oak. Then, as he looked closer, he saw that his comrade seemed to be enmeshed in its branches. At this moment clouds which had half-veiled the moon drifted away and he then saw that a branch of the tree was actually wound around his comrade’s neck, while stronger branches held him firmly clasped to the bole itself. 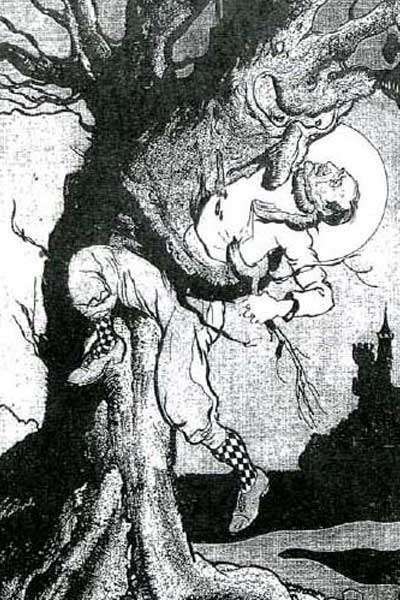 And in the weird light of the moon a huge, evil, grotesque face seemed to gleam out from the trunk, staring with malevolent eyes upon the contorted face of the strangling man! The sight was too much for the traveller. He fled in earnest now, stumbling at dawn into the village, where he told his story. When the sun was up he led a party back to where he had slept. There, at the base of the tree, lay the body of his comrade. He had been strangled to death. The neck was bruised and on his body were cuts as though great claws had torn him. So sinister became the tree’s reputation that it was at last ordered to be cut down and burned. However, its site for many years remained haunted and a peril to anyone who ventured near after nightfall. Download various PRINT Versions of this and many more stories here (this one is on page 112 of the PDF). Visit The Website.